GM, why won't you advertise the Chevy Volt? I bought a Chevrolet Volt that came off of a lease last May and have owned my Volt since last May. Its capabilities as a car is something not understood by the average person. When I tell my friends that I average 35-45 miles on electricity they are impressed. But trying to explain the gas generator is more difficult and confusing for the average guy driving a Ford F-150. In an effort to atone for past sins I really think GM poured all they had into the Volt. For those who aren't aware, I get an average of 35-50 miles on pure electric power day in day out. I plug in at night to an outlet in my kitchen and the next day I am ready to go 35-50 miles again. It takes 9 hours to charge. I just installed a 240 outlet so I now charge in 4 hours. Acceleration in electric mode off the line is very spirited if not fast, up to 30 MPH. After that you can get to 60 MPH in about 8.1 seconds. Driving Chevy Volt adds approximately 30 dollars to my electric bill each month. Charging overnight with off hour rates, I spend about 30 dollars a month to charge my car. Driving approximately 35 miles per day I am driving 950 miles for 30 dollars. You can't do that with many cars. And when that electricity runs out I can drive with gas for 300 more miles, until I can charge again. The car is solid. The doors close with a solid thunk. 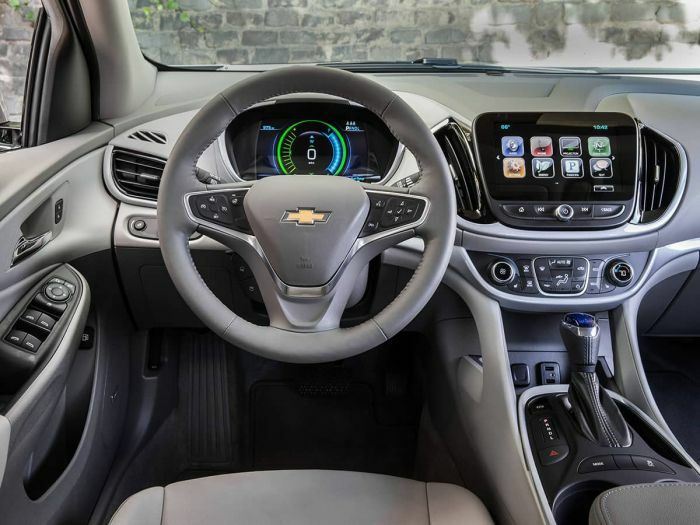 The interior of the Chevy Volt is well put together. Trim pieces, glove box doors and switches work great. Something I can't say about my Saturn. I have always purchased American cars. I once owned a Volkswagen Fox station wagon. My first car was a 1967 Chevy Nova. I loved that car, but I will never go back. I will continue to purchase and own GM cars with the Voltec drivetrain and I may eventually move to a pure electric Bolt. Here, compare Chevy Volt vs Chevy Bolt. I have test driven them and the Bolt is a great car. Even if GM discontinues the Volt as has been reported, the Volt drivetrain will live on in a crossover vehicle or some other car. The sky's the limit. My day starts. I leave my house and unplug my Volt. Its summer and my guess'o'meter shows 47 miles on the charge. I'm happily running errands. Stopping at the Grocery store. Going to the gas station for a Diet Coke. The clerk says, "are you getting gas today?" "No thanks" I say. Off to Walmart and then Home Depot with another stop at the gas station. The clerk says, "are you getting gas today?" Nope I say cruising electric. My day cruising electric ends. My day ends and I have reached a new milestone. For the first time I hit 51 miles on pure electric power. As I fall asleep on the couch my wife calls out to me, "honey did you plug in the car". No one that has asked me about my Volt had any idea how it worked. Some didn’t even know it had a gas engine, others thought it was like a Prius. Probably because GM and Chevy lose money on Volts and would prefer to sell the hotter/more profitable SUVs. Common business practice regardless of what Mary Barra says. Many CEOs don't walk the talk. GM is discontinuing the Volt, so why on Earth would they spend money advertising it? "Utilizing the “Hold” function any time speeds drop below 55mph during long trips, the gas mileage has exceeded 50mpg" GM should add an extend function where the generator runs at it's highest efficiency regardless of battery drain. I don't know that I've seen an ad for any plug in other than the Pacifica, and they just call it a hybrid. Apparently, car makers think the public is too dumb to understand plug-in hybrid vehicles. The true reason for the Volt...They are discontinuing production because of major sales slumps due to the release of the BEV/Fully Electric Bolt. So why aren't they promoting the Bolt you say...They can't afford to...Ask me why? Most GM salespersons don't really know how Volt works. When I purchased my Volt, I felt like I was way more knowledgable about Volt than all the sales guys that I had talked to. Actually I was shocked when for about 2 seconds a Volt appears in Chevy's new ad about first time Chevy buyers. The author is right. My commute is 38 miles, and I fill up my gas tank once every 3 months. Electricity is cheap, I spend 70 to 80 cents a day vs the 3.50 a day I would have spent on gas with the last car. And used Chevy Volts are pretty cheap. You can get the premium trim for 14k, 3 years old. There is no range anxiety, because it has a gas engine. The second generation Volt is more fun to drive, but it acts more like a hybrid. Still, it's all electric range is even better than mine, 53 miles. I have a Chevy Volt, and this is how I would advertise it....... It's a car that uses electricity for everyday commutes, and gas for weekend getaways. This is the best combination because lithium ion batteries are very heavy. A Tesla battery weighs 1200 lb, about the weight of 4 full size refrigerators. Since you typically commute less than 25 miles to work, that means lugging around 900 lb of unused batteries for no reason at all. With the Volt, you only carry the battery size you need, and you have gas for long distance trips which is far more preferable than looking for non-existent charging stations during those infrequent trips.